Fr Gerard Woo Ling is an Assistant Priest at St Mary’s Cathedral. Born in Trinidad and Tobago, from a family of eight children, Fr Gerard worked in a finance department for a life insurance company for 16 years before moving to Sydney in 2005. He then worked for another 4 years prior to commencing his studies for the priesthood at the Seminary of the Good Shepherd at Homebush in 2010. On 24 August 2017, the feast of St Bartholomew, Fr Gerard was ordained by Archbishop Anthony Fisher OP at St Mary’s Cathedral. 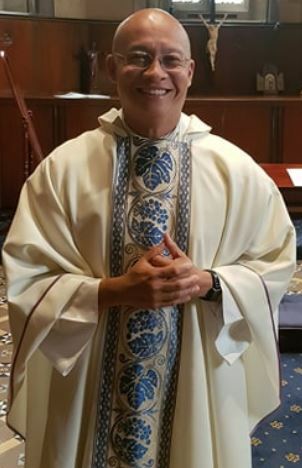 Prior to and after his Ordination, he was appointed to the Parish of Regina Coeli, Beverly Hills; before being assigned to the Catholic Community of City South – Roseberry, Redfern & Waterloo in 2018. On 17 January 2019, Fr Gerard was appointed to his current role at St Mary’s Cathedral. Since being ordained to the priesthood, Fr Gerard has encountered a number of gratifying moments that has defined his role as a priest, but being the link between Christ and the faithful is what he values the most.